The organisers of the Tour de Pologne, the Tour of Poland, have announced the list of 23 teams that have been invited to this year’s race, which runs from August 1st to 7th. As a part of the UCI’s flagship ProTour series the eighteen ProTour teams have received automatic invitations, with a further five allocated to teams eligible under the UCI wildcard system. In common with many of the major races, two of the wildcard invitations have been awarded to the Cervélo TestTeam and the BMC Racing Team. Both teams boast many ProTour quality riders, including World champion Cadel Evans, US champion George Hincapie and former World champion Alessandro Ballan at BMC Racing, and 2008 Tour de France winner Carlos Sastre and current green jersey wearer Thor Hushovd at Cervélo. Having both missed out on invitations to all three of the Grand Tours, as well as many of the major one-day races, a race organiser has finally smiled on the two Dutch Professional Continental teams: Vacansoleil and Skil-Shimano. Having both raced aggressively at the beginning of the year, the Dutch teams have rarely been seen in ProTour level races as the competition for places has been strong; most places have been awarded to teams of the race’s home country. The final place has been awarded to a mixed team of Polish nationals to ensure a good representation of local riders. This used to be against the regulations of the ProTour, which stipulated that the only teams eligible teams were ProTour teams or Professional Continental teams with wildcard status; this regulation was relaxed at the beginning of the season to allow a similar team from Australia to take part in the Tour Down Under. 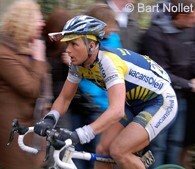 Last year’s edition of the race was won by then World champion Alessandro Ballan, as he salvaged a season ruined by cytomegalovirus. AG2R-La Mondiale, Astana, Caisse d’Epargne, Euskaltel-Euskadi, Footon-Servetto, Française des Jeux, Garmin-Transitions, Lampre-Farnese Vini, Liquigas-Doimo, OmegaPharma-Lotto, Quick Step, Rabobank, Sky Professional Cycling Team, Team HTC-Columbia, Team Katusha, Team Milram, Team RadioShack, Team Saxo Bank. Reprezentacja Polski (Polish Representation), Vacansoleil Pro Cycling Team, Cervélo Test Team, BMC Racing Team, Skil-Shimano.